Yay! More magazine press! 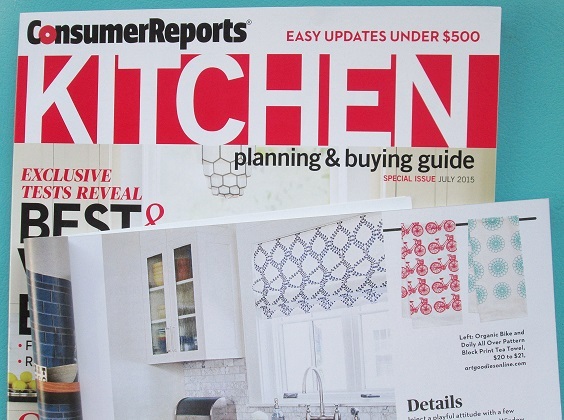 This time artgoodies gets the seal of approval from Consumer Reports in their Kitchen Magazine, July issue, page 11! My all over bike and all over doily pattern organic tea towels are at the top of the page! Thank you! Ok, so here’s the deal. I’m staying home this holiday. I NEVER stay home on a holiday weekend unless there’s something serious happening, like a photo shoot of my house for example. No, there’s not another photo shoot, at least not right now. I’ve been gone half of this month and I’m trying to slow it down. I’m still struggling with the idea, enough where I might get twitchy and just jump in the car because I can’t stand it, but I’m planning to do yard work, nap, hang out with friends, and rustle up some vintage. 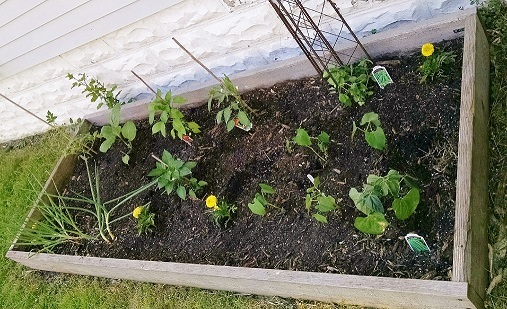 I’ve gotten started on yard work this last week by replanting the front yard and putting in the veggie gardens but I’ve got a ton of trimming, digging, and dividing to do! I’m also going to have a SALE in both shops! This weekend you can save 25% off my artgoodies and vintagegoodies shops! 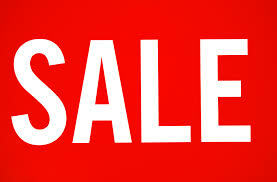 The SALE starts at 3 pm today and goes through Tues at early bird am! Show of Hands this weekend in CHICAGO! This weekend I’ll be selling artgoodies products at the Show of Hands show in Chicago. Click here to see all the other amazing maker designers who will be there! And bring Mom, it is Mother’s Day Weekend after all. Color of the Month May 2015! April was a busy month with the Apartment Therapy photo shoot/ home tour, finishing and sending off product to Whole Foods stores in NY. I partnered up with Whole Foods and Etsy Wholesale for that one, I’ve been sew busy (pun intended) I think I forgot to share that here. Also, getting ready and traveling to and from The Country Living Magazine Fair in TN (more on that later), birthdays (including mine), my parents anniversary, the start of vintage buying season, and my regular artgoodies work load. I’ve been crazy busy but I’ve been having a great time. I’m beginning to wonder what kind of energy I’m operating on. My mom has been telling me for quite some time I’m like the Energizer bunny. I guess when you’re happy doing what you love you have extra power to keep going. Also, the fact that you are entirely responsible for it ALL adds a little push. Truth be told after this last month and travel I went to bed at 7:15 last night. But, I got up at 4 am to go to an antique show over by Detroit with my pal Abby of Binks and the Bad Housewife. It’s nice when you can find friends who drank the go go juice from the same magical fountain of go getters. Flea marketing and antique shopping with someone who is also an early bird and can keep the pace is helpful. You get in and out like a vintage ninja before the crowd has had their coffee. For most of my vintage finds as of late follow me on instagram here, get a sneak peek before items head to the shop! Now about that color of the month! Enjoy! 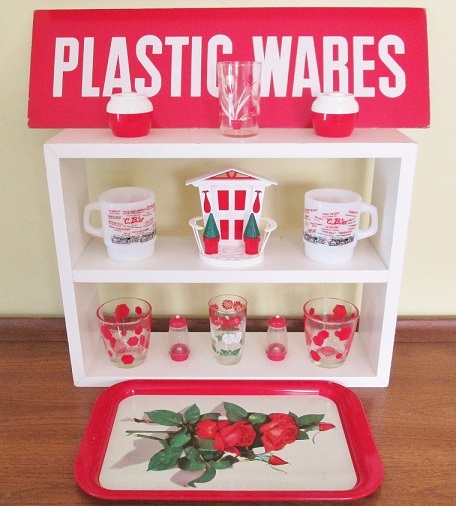 Fave vintage items: the sign! salt n p napkin holder house! swanky swigs, cb mugs, patterned glasses, tray,salt n p’s. 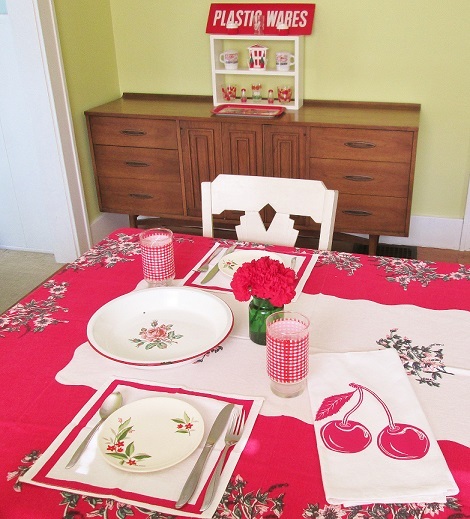 Fave vintage items: gingham glasses, enamel pie tin, napkins used as place mats, little flower plates, and tablecloth. An artgoodies cherry tea towel and red carnations finish the look!